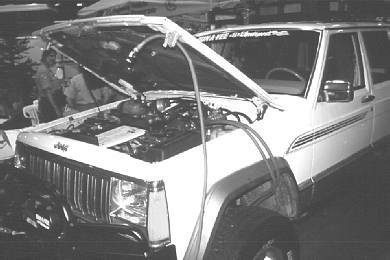 I bought a high mileage 1990 Cherokee from Don-A-Vee Jeep in Placentia, CA. If I was going to do it again, I would buy a 1991 or newer. These motors have more horsepower. 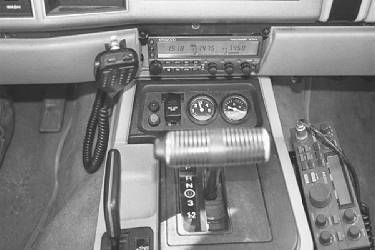 The Kenwood 733A ham radio controls were installed in the ash tray slot. 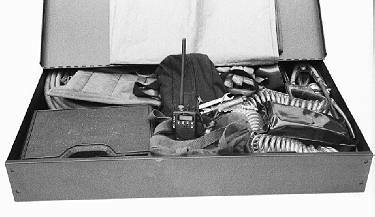 The main body of the radio was installed on the rear side panel across from the original tire mount. 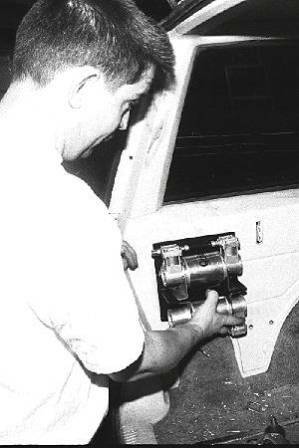 The CB is installed facing up, on the passenger's side of the center console. 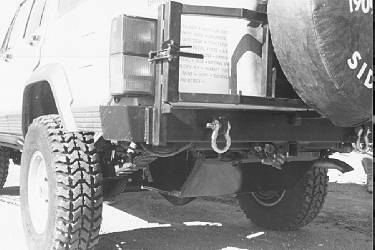 Tri-County Gear in Pomona installed a complete Dana 44 rear end with an ARB locker. They also changed the front gear ratio and installed a TrueTrac (limited slip). This combination worked perfectly for trail and street. 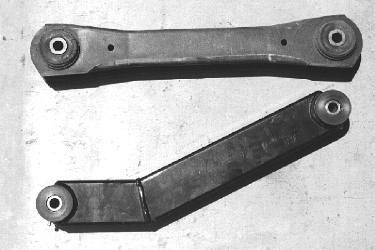 The stock model 35 axle is too weak for any real abuse (left picture). So the complete differential was changed to a Dana 44. Currie Enterprises makes a transfer case shortening kit which will extend your driveshaft 4" and allow you to replace the slip yoke with a bolt-on style drive line. This also allows you to run your vehicle without a rear drive line. Otherwise the transfer case oil will run out after the slip yoke is taken out. 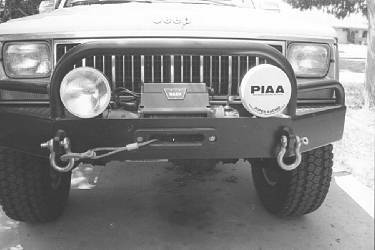 Off Road General Store trimmed the front fenders after the new front Nairobi bumper was installed. The Confer rack is basically a starter kit. I welded the two pieces together, welded expanded metal for a bottom, welded angle iron along the front and back to reinforce the expanded metal, welded the roof railing brackets together and then welded tabs for the radio antennas. 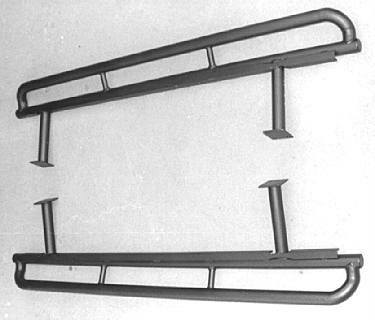 When it was completely assembled, the rack was sand blasted and powder coated. Somebody should make a completed rack. 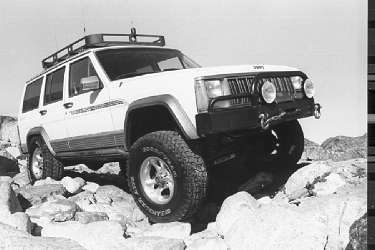 Did you ever notice the rear quarter panel on a stock Cherokee? If it has been wheeling much, it is bent. I bent mine on an easy trail within the first 3 months I owned the vehicle. National Spring in Cajon, CA built the custom rear springs to match the front height and carry the weight. A Tuffy box full of stuff and a Canyon City Tire Rack complete with two cans and Hi-Lift Jack overloaded the stock springs in a hurry. Canyon City welded their tire rack to my bumper. 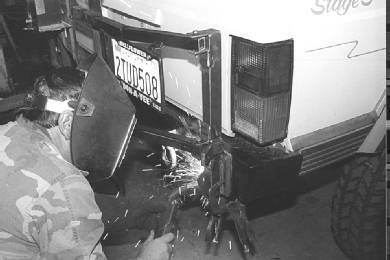 I noticed they are now producing their own bumper with the mounting for the their tire rack already welded on. This would be my choice for a rear bumper next time. This picture shows the Canyon City tire rack and the new 34 gallon Aero Tank. The new tank has a skid plate welded on it and is made of much better material. 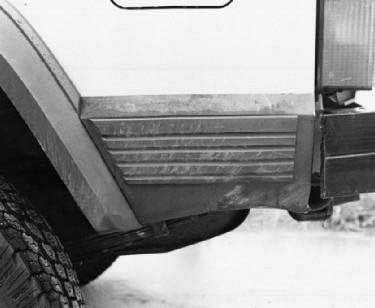 Off Road General Store makes the best rocker panel protection I've seen. 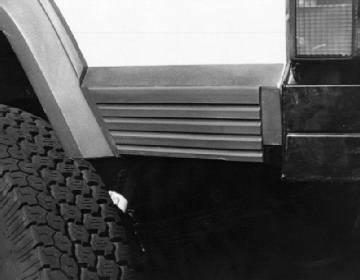 A lower bar protects the undercarriage while the upper double-bent tube protects the door. The Vision Research seats were the best seats I could find. 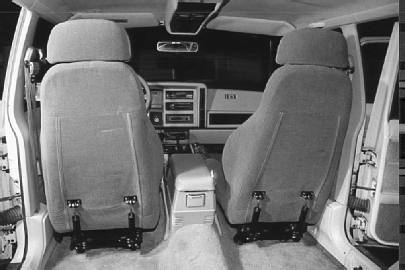 The suspension system on these seats was incredible. Unfortunately this company is out of business. Refer to our AJ-8 for information about Beard Seats. 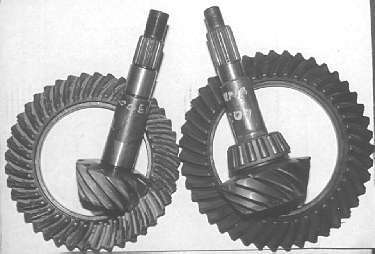 Did you ever wonder why 4-wheelers change the stock differentials to a Dana 44 or a Ford 9 inch? 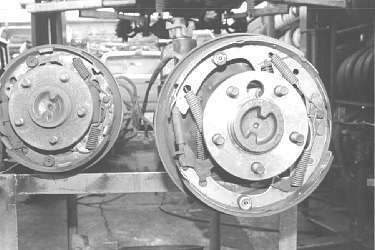 Check out the difference in brakes: 9.5" to 11" plus the Dana 44 brake shoes are wider. 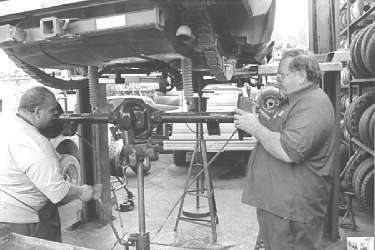 Both the rear bearings and rear axles are bigger in a Dana 44 than the original Model 35. 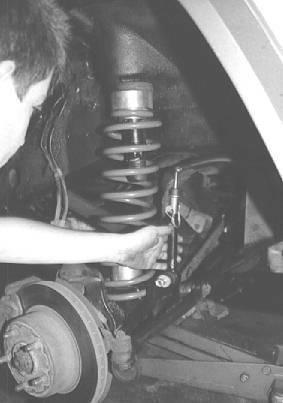 JKS disconnects were used to allow for a quick disconnect of the front sway bar while off roading. You can also see the aluminum spacer that Off Road General Store uses to add lift to the Rancho Lift Kit springs. In total the vehicle sat 5" higher than stock. 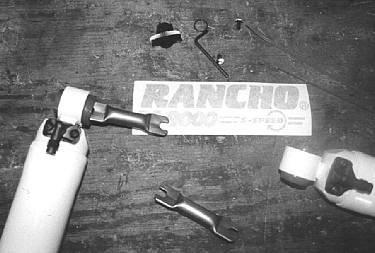 Off Road General Store had figured out how to change the ends of the Rancho 9000 shocks to a more common end. 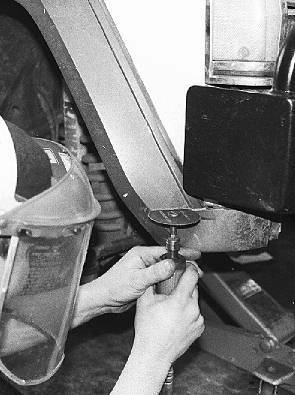 This allow them to access a wider range of shock lengths for a custom vehicle. Exotic Body Works trimmed up the rear quarter panels and welded a plate across the bottom to keep the water out. I never hit it again. The R&M Hot Water Shower and a Premier Power Welder were installed under the hood. I got plenty of use out of both of them. The Tuffy rear storage box makes it easy to keep all the items neat that you need to carry when you leave the pavement. 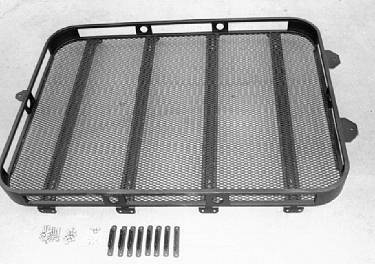 Aero Tank has several tanks available for the Cherokee or they will build what ever you want.